DeMar DeRozan is as good as ever, proving that he is a perfect fit with the Spurs and showing that they can't be dismissed just yet. It became a bit fashionable this summer to predict the Spurs as an odd team out in the Western Conference playoff picture. As LeBron came to Los Angeles and the West continued to improve, San Antonio lost its heartbeat in Tony Parker and Manu Ginobili, as well as its best player in Kawhi Leonard. With so much change within the fabric of the fanchrise, the team's streak of 21 straight playoff appearances was thought to be in serious jeopardy. Then lightning struck twice as the Spurs’ roster continued to thin in the preseason. Defensive ace Dejounte Murray tore his ACL on Oct. 8, ending the 22-year-old point guard’s year before it ever started. Spurs first-rounder Lonnie Walker underwent surgery for a torn meniscus on the same day. Amid the departures and injuries, a common question appeared: would the turnover be too much to overcome? Gregg Popovich, DeMar DeRozan and the Spurs had an answer. San Antonio has hummed along as usual to start the season, going 5–2 with a pair of wins over the Lakers, a victory against the Timberwolves and an overtime triumph over the Mavericks on Monday. Perhaps Popovich, the greatest coach of his era, felt disrespected this offseason with so many doubting his team. The Spurs made the playoffs last season with just nine games from Leonard, so Popovich could make do with DeRozan, right? DeRozan has been better than advertised thus far. The former Raptor has thrived in San Antonio, averaging 27.9 points, 7.3 assists and 5.7 rebounds per game. He posted a 30-point, 12-rebound effort in a 110–106 win against the Lakers, followed that with 34 points in an overtime victory over Dallas and finished with 25 against Phoenix. DeRozan has continued to be a true top option, proving back-to-back All-NBA appearances in Toronto were no fluke. And while the Spurs would be better off today with a happy and healthy Leonard, DeRozan is an impressive return. He’s on the right side of 30, and he’s already integrated himself well within San Antonio's scheme. The ball-pounding days that often hindered Toronto come playoff time look to be in the rearview mirror. DeRozan seemed to relish bullying Wesley Matthews down the stretch against Dallas, icing the win with a step-back over in overtime. DeAndre Jordan and the overmatched Maxi Kleber couldn’t stay in front of DeRozan when Dallas opted to switch, as the four-time All-Star blew past Mavs bigs guarding against his patented mid-range pull-up. The entirety of DeRozan’s offensive arsenal has been on display through seven games. Popovich and DeRozan are an anachronistic match made in heaven. The Spurs have attempted the third-fewest threes per game this year while shooting the most mid-range shots, pairing DeRozan with LaMarcus Aldridge and creating a crowd inside the arc. San Antonio's offense hasn’t just survived in this mold to start the season, though, it’s thrived, ranking No. 11 in offensive efficiency and No. 12 in points per game. This year’s attack looks more sustainable under DeRozan, who continues to generate crunch-time buckets in a new city and new conference. DeRozan has replaced Leonard as the Spurs’ bailout candidate late in the shot clock. When a bucket is needed, DeRozan rises to the occasion. The Spurs’ torrid shooting start should see some regression. For now, Rudy Gay, who has hit eight of his first 12 threes, is knocking down an outrageous 64.3% from deep and Bryn Forbes is banging home triples at a rate of 45.5%. DeRozan, Forbes and the ever-reliable Patty Mills have created a workable backcourt that hasn’t missed Murray as much as one would suspect. Marco Belinelli has provided a much-needed deep threat as well. The West won’t wilt as we turn the calendar to 2019, and the competition for eight spots will remain fierce. Don’t expect the Rockets to continue their early-season slide, and LeBron’s Lakers will find their groove, even if it takes a trade or lineup change. But San Antonio shouldn't end its season on the wrong side of the playoff ledger. 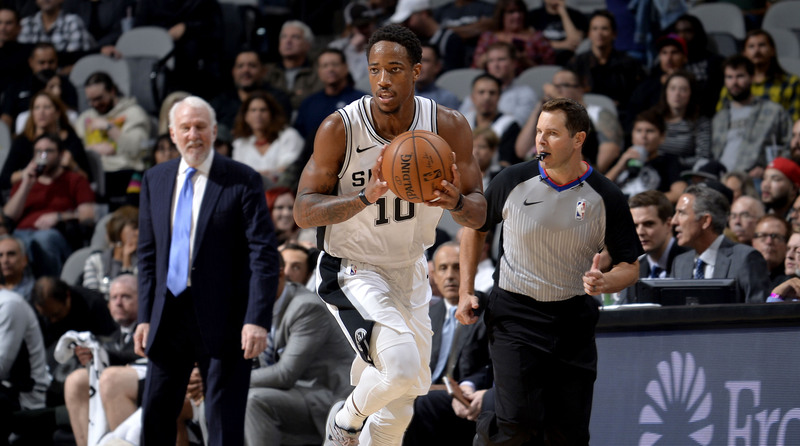 DeRozan has picked up where he left off in Toronto, and Popovich has mined an effective rotation from an undermanned cast.